Small-town sleuths Brandy and Vivian Borne--with their trusty shih tzu, Sushi--head for a Big Apple comics convention to sell a rare 1940s Superman drawing. When an intruder breaks into their hotel suite, their madcap Manhattan misadventure is only beginning. Soon the out-of-towners stumble onto a murder victim impaled by a pen-shaped award. Villains abound--from cartoonists to crime bosses--creating a jumble of clues. Brandy and Vivian will leave no comic-book page unturned in their race to trap a ruthless killer. BARBARA ALLAN is the joint pseudonym of acclaimed short story writer Barbara Collins (Too Many Tomcats) and New York Times bestselling mystery novelist Max Allan Collins (Road to Perdition). 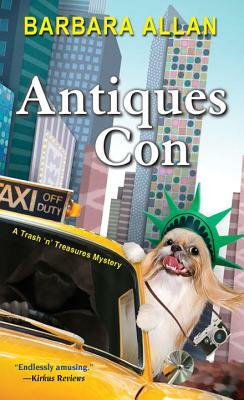 Their previous collaborations have included one son, a short story collection, and ten novels, including the 2008 winner of the Romantic Times Toby Bromberg Award for Most Humorous Mystery, Antiques Flee Market. They live in Iowa in a house filled with trash and treasures. Learn more about them at www.maxallancollins.com and at www.barbaraallan.com.